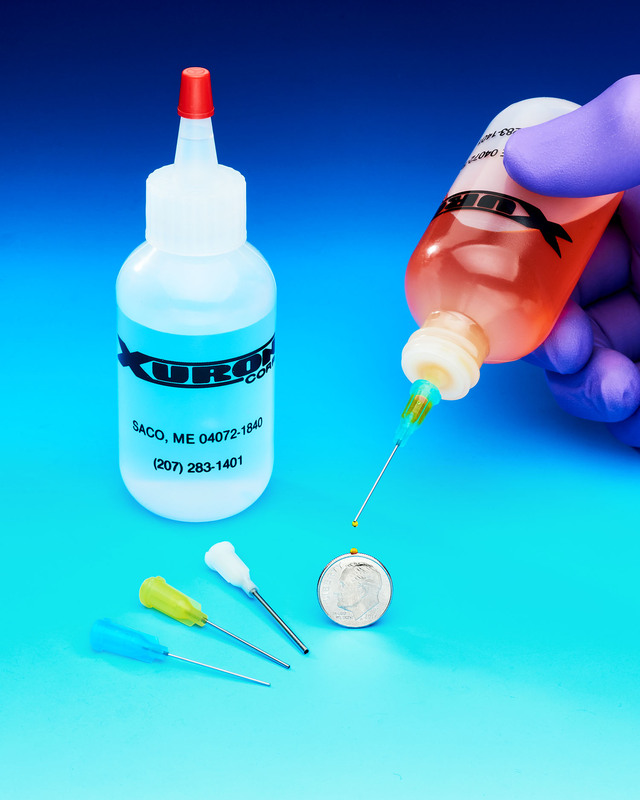 A new addition to their line of precision dispensing bottles that includes three color-coded stainless steel capillary tube tips for the controlled dispensing of liquids is being introduced by Xuron Corp. of Saco, Maine. The Xuron® 860-Two Ounce Dispensing Bottle includes three stainless steel capillary tubes with industry standard luer hubs that come in color-coded sizes for controlled liquid dispensing. Featuring a white tip with 0.040” I.D., yellow tip with 0.020” I.D., and a blue tip with a 0.010” I.D., these pliable polyethylene dispensing bottles are self-sealing to prevent spills. Suitable for the precise dispensing of a variety of different liquids, the Xuron® 860-Two Ounce Dispensing Bottle with three tips is one of a series of bottles which can each be purchased individually. They include the 800 Dispensing Bottle which a plastic spout, 810 with the 0.010” I.D. tip, the 820 with the 0.020” I.D., and the 840 with the 0.040” I.D. tip. The Xuron® 860-Two Ounce Dispensing Bottle with 3-capillary tube tips sells for $6.75 (list); the 810, 820, and 840 Dispensing Bottles with a single tip are $6.30 (list) and the 800 Bottle with no tip is $3.75.